Michael D. Gershon M.D. is the physician that started the scientific community on its awareness the gut is the "second brain" in 1996. He has popularized this term to refer to the nervous system within the gut, the enteric nervous system (ENS). He states it is the intrinsic innervation to the bowel. He wrote the book, The Second Brain. Dr Gershon is the chairman of the department of anatomy and cell biology at Columbia. Dr Gershon has received grants from the National Institutes of Health. He said on his research, "I became painfully aware of the influence the brain has on the gut." In fact, anyone who has ever felt butterflies in the stomach before giving a speech has experienced this gut feeling. Some may have felt intestinal urgency or even diarrhea before an examination or other demanding activity. This is the interconnectedness and action of the dual nervous systems. Dr Gershon feels the connection between the two brains may have a major relationship to dysfunction and many diagnosed conditions of both emotions and physical symptoms. He looks to this connection in anxiety, depression, irritable bowel syndrome, ulcers and Parkinson's disease etc. Both Dr Gershon and Dr Emeran Mayer, a professor of medicine, physiology and psychiatry at UCLA state believe the majority of patients with anxiety and depression will also have alterations of their GI function, which can be one of the predisposing factors in the dysfunction. Both the brain and the gut share in function and their treatment overlap in results and possible side effects. As you help one to normalize, you help the other. If what you do in treatment causes side effects, you may cause them in both areas. Antidepressants, for example, cause gastric distress in up to a quarter of the people who take them. Stress of any kind can also overstimulate the nervous system, including the ENS. One example is stress affecting the esophagus that can cause a feeling of choking, which can yield marked anxiety. 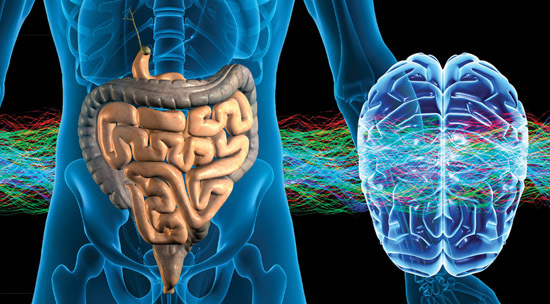 Gershon, along with a number of like-minded researchers are studying brain-gut connections in the relatively new field of neurogastroenterology. New understandings of the way the second brain works and the interactions between the two are helping to treat disorders like constipation, ulcers and Hirschprung's disease. The role of the enteric nervous system is to manage every aspect of digestion, from the messages sent by the brain and the interconnectedness of the mouth, esophagus, stomach, small intestine and colon. The second brain is a very nearly self-contained network of neural circuitry, neurotransmitters and proteins. Jackie D. Wood, professor of physiology, cell biology and internal medicine at Ohio State said, "Rather than Mother Nature's trying to pack 100 million neurons someplace in the brain or spinal cord and then sending long connections to the GI tract, the circuitry is right next to the systems that require control." "What brains do is control behavior," Wood said. "The brain in your gut has stored within its neural networks a variety of behavioral programs, like a computer. The digestive state determines which program your gut calls up from its library and runs." Remember, research shows foods contain messenger molecules that alter hunger, digestion, cravings, and weight, which certainly affects our health. Let's look at the physiology. If you miss a meal, the gut is fairly silent other than sending a hunger signal. If you eat junk food or a non-food like GMO alterations, gluten or other sensitivity/allergic substances, you set up a cascade of reverse contractions that force it and everything else in the gut back towards and even into the stomach and back out through the esophagus. This causes serious consequences. The ENS in the gut always evaluates what we put in our mouths, decides on the course of action and initiates multiple reflexes to carry out the message. "The gut monitors pressure," Gershon said. "It monitors the progress of digestion. It detects nutrients, and it measures acid and salts. It's a little chemical lab." The ENS does this on its own, with little input from the central nervous system. We have all experienced an emotional stress affecting our digestion. Many of you that are DC's, DO's, ND's or Acupuncturists have seen a spinal adjustment, spinal or visceral manipulation, craniosacral therapy or a meridian balancing help digestion almost immediately. Gary M. Mawe, a professor of anatomy and neurobiology at the University of Vermont stated "Clinicians are finally acknowledging that a lot of dysfunction in GI disorders involves changes in the central nervous system. My experience is it is hard to say which comes first, physiology or psychology?" A very interesting fact is that about 95 percent of the body's serotonin is in the gut. Here, it acts as a neurotransmitter and a signaling mechanism. The digestive process begins when a specialized cell, an enterochromaffin, squirts serotonin into the wall of the gut, which has at least seven types of serotonin receptors. These receptors communicate with nerve cells to start digestive enzymes flowing that start the food bolus moving through the intestines. Serotonin is the communicator between the gut and brain to keep both nervous systems in harmony. Another very interesting fact is 90 percent of this information is traveling only one way, from the gut to the head. One of the main nutritionals I evaluate for in GI dysfunction is a BioEnergX product, MaX GI, which is a synergistic blend of nutrients for both the small and large intestine. Xymogen has a variety of the most advanced probiotics and blends such as the ProbioMax that has 6 different options. It is important to evaluate stomach acid and enzyme support such as GastrAcid and Xymozyme. The gut also contains 80-90% of the immune system. If we find the GI tract needs nutritional support for dysbiosis, we consider MaX VRL, MaX Immune and MaX Para. This is a very fascinating subject. We will discuss it further in our Puzzle Pieces and in the seminars. We look forward to seeing you at one of our webinars and seminars soon. Dr. Brimhall's Health Puzzle Piece is a weekly email newsletter distribution that has been brought to you by the collaborative efforts of the Brimhall Wellness Team. All newsletters are published and available at www.Brimhall.com a division of Health Path Products, LLC. The above statements have not been evaluated by the FDA. The nutritional information, suggestions, and research provided are not intended to diagnose, treat, cure, or prevent disease and should not be used as a substitute for sound medical advice. Please see your health care professional in all matters pertaining to your physical health.